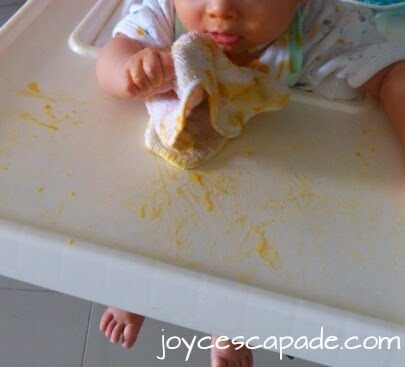 This week, it's time for organic millet powder porridge with pumpkin puree. Why millet? Millet is rich in B vitamins, potassium, phosphorus, magnesium, iron, and is even considered a good protein source. Millet grains are usually used to cook millet porridge (after soaking for a few hours). 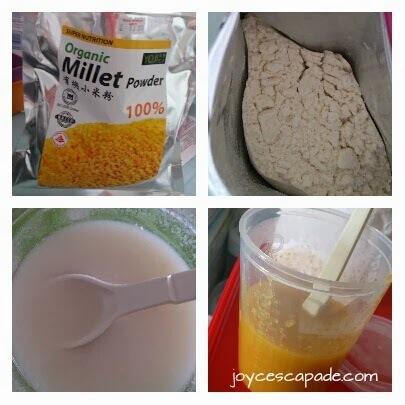 I use millet powder because it's easier and faster to prepare. I can either add boiling hot water or cook it for a few minutes only in the morning. I buy half a pumpkin and cut it into six slices (with skin intact). Then, I store them in separate ziplock bags in the fridge. Every morning, I take out one slice, cut into cubes and steam before pureeing. I prepare the millet porridge separately by mixing one tablespoon of millet powder with three tablespoons of boiling hot water. Then, I mix both millet porridge and pumpkin puree together. Finally, I add a teaspoon of virgin coconut oil.